This sweepstake is sponsored by Hoo-rag (hereinafter referenced as “Sponsor”). This contest is governed by these Official Rules. By participating in the contest each entrant agrees to abide by these rules including all eligibility requirements. Entrants agree that they understand the result of the contest are determined by Sponsor and that the determination by the Sponsor or its agents is final in all respects.The contest is subject to all federal, state and local laws and regulations and is void where prohibited by law. The Contest is open to legal residents of the United States and Canada, who are eighteen (18) years of age or older at the time of entry, have internet access and a valid e-mail account prior to the beginning of the Sweepstakes period. Sponsor has the right to verify the eligibility of each entrant. The Deal: Guess the Four Final Teams for the 2018 March Madness Tournament. First 5 to guess correctly win! 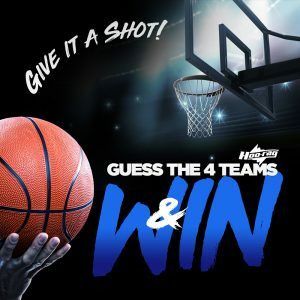 Winners who guess correctly will be selected once the Final Four are announced. If a potential prize winner cannot be reached by Administrator (or Sponsor) within fifteen (15) days using the contact information provided at the time of entry, or if the prize is returned as undeliverable, that potential prize winner shall forfeit the prize. If a potential winner fails to comply with these official rules, that potential winner will be disqualified. Prizes may not be awarded if an insufficient number of eligible entries are received. The First Winner will receive a $25 Gift Certificate from Sponsor. The Second Winner will receive a Hoo-rag Hat of their choice. Runner-Up Winners will be selected from across several social media platforms and will receive a Hoo-rag of their choice. Some designs may be deemed ineligible due to royalties or other restrictions. Hoo-rag retains the right to request a winner make a different selection if necessary. Prize is non-transferable. No substitutions or cash equivalent of prizes is permitted. Sponsor reserves the right to terminate, suspend or amend the Sweepstakes without notice, and for any reason to include: the Sweepstakes cannot be conducted as planned, a computer virus or bug disrupts data collection, tampering or unauthorized interventions, technical failure, or any other cause beyond Sponsor’s control that corrupts the administration, security, fairness, integrity or proper play of the Sweepstakes. In the event any tampering or unauthorized intervention may have occurred, Sponsor reserves the right to void any and all suspect entries at issue. Sponsor and its respective parent, affiliate and subsidiary companies, agents, and representatives, and any telephone network or service providers, are not responsible for incorrect or inaccurate transcription, omission, interruption, deletion, line failure or malfunction of any telephone network, computer equipment or software, the inability to access any website or online service or any other error, human or otherwise.